On Saturday, July 28, at 1 p.m., meet at Perkins House. Mount Holly historian Dennis Devereux will present a program on the history of the springs and lead a car tour to the site of the springs. 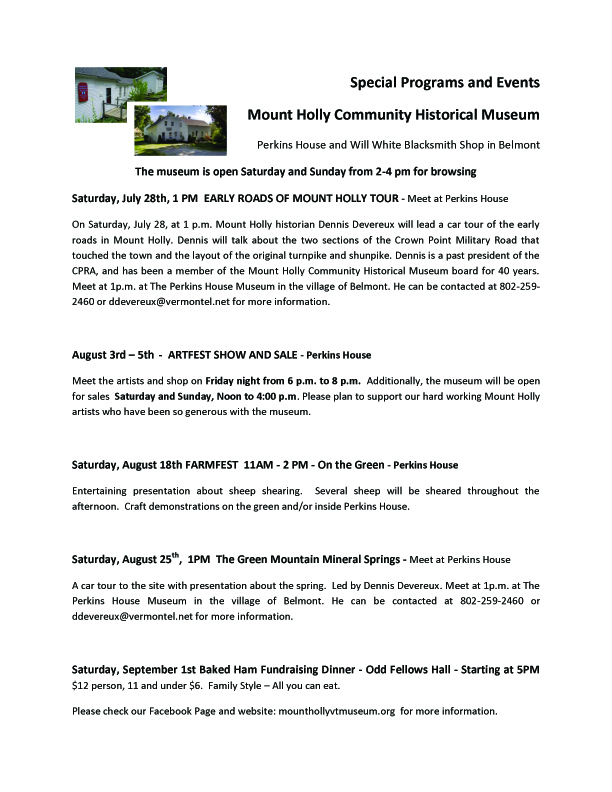 On Saturday, July 28, at 1 p.m., meet at Perkins House for the Early Roads of Mount Holly Tour. Mount Holly historian Dennis Devereux will lead a car tour of the early roads in Mount Holly. 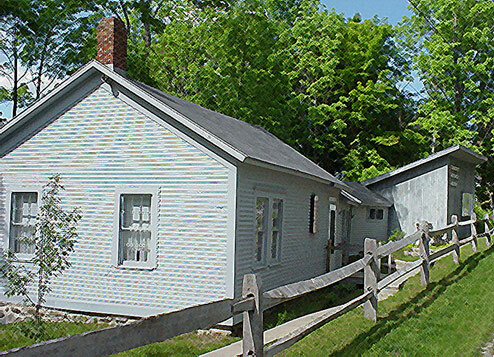 Dennis will talk about the two sections of the Crown Point Military Road that touched the town and the layout of the original turnpike and shunpike. Dennis is a past president of the CPRA, and has been a member of the Mount Holly Community Historical Museum board for 40 years. He can be contacted at 802-259-2460 or ddevereux@vermontel.net for more information. The annual meeting and potluck dinner is Tuesday, July 17, at 6 p.m. at Odd Fellows Hall in Belmont. Town historian, Dennis Devereux, will present the program â€œHistory of the Museumâ€™s Founding.â€� The public is invited. Potluck postcard notification will be sent to members. by Lory Doolittle at Perkins House in Belmont. Lory is a second generation, 43-year member of the Herb Society of America for which she has served several times on the National Board of Directors. She will discuss an herbal lifestyle: growing, cooking, designing, preserving. New chemical studies have started to confirm and debunk ancient herbal uses pursued by our ancestors. Come for a presentation gleaned from a lifetime of enjoyment with herbs.